I created this pattern from a photo that was emailed to me. The finished panel is installed in one of the windows in our home. 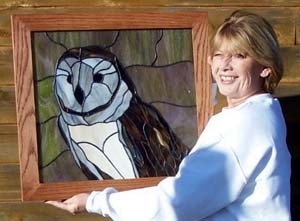 I started working with stained glass in 1993 after attending a stained glass workshop in one of our small towns. I always purchased patterns but seldom found any that matched my interests. I love animals of any kind — horses mostly. Much of what I found didn't have a lot of detail and most looked too cartoonish. In 1996 I contacted Paned Expressions to turn a photograph of horses into a pattern. I was amazed at how much they captured the personalities of the horses, and how quickly they did it. I later found out that they made the pattern with Glass Eye 2000. I downloaded the 30-day trial and was hooked! Today, I make and sell patterns on my website. I also offer custom patterns for stained glass artists and often construct the panels myself. Recently I have started making patterns and designing custom stepping stones as memorials for deceased pets. Many of my clients purchase my patterns for wood burning, leatherwork, window painting and quilts. 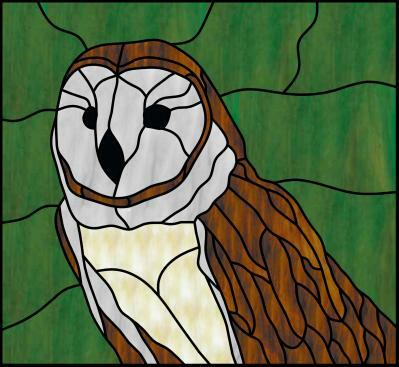 Barn Owl measures 25" x 23" with 70 pieces of glass. This panel is done with the copper foil method with a zinc frame. The owl body is W-199, the cream color is K-11K, and the gray is A-111SO. The background is an unknown green textured glass. The oak frame was made by my husband Bill. He cut a channel in the oak boards for the panel to sit in and then mitered the corners. To finish it off I added a mahogany stain and a gold chain for hanging. If it wasn't for Glass Eye 2000 I wouldn't have the home business I have now. Thank you Dragonfly Software for such a wonderful program for the glass artist! Sandy and her husband, Bill, live in the Missouri Ozarks. They own and operate a Jersey Dairy Farm and have 30 Curly Haired Missouri Foxtrotting horses. Sandy's dream is to have her patterns published. You may reach Sandy by email.